IN this festival the Church commemorates the happy departure from life of the Blessed Virgin Mary, and her translation into the kingdom of her Son, in which she received from Him a crown of immortal glory, and a throne above all the other Saints and heavenly spirits. 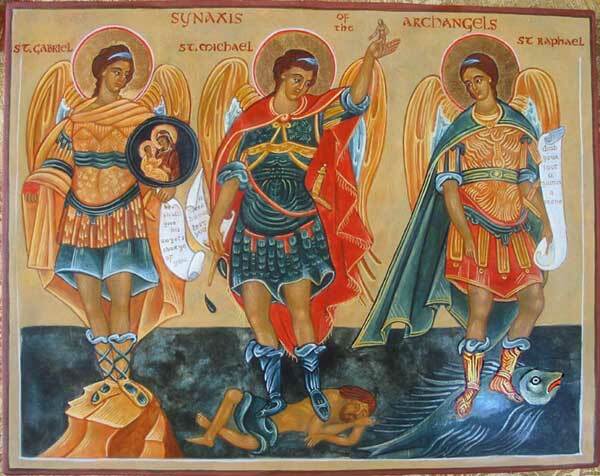 After Christ, as the triumphant Conqueror of death and hell, ascended into heaven, His blessed Mother remained at Jerusalem, persevering in prayer with the disciples, till, with them, she had received the Holy Ghost. She lived to a very advanced age, but finally paid the common debt of nature, none among the children of Adam being exempt from that rigorous law. But the death of the Saints is rather to be called a sweet sleep than death; much more that of the Queen of Saints, who had been exempt from all sin. It is a solemn dogma, proclaimed by Pius XII from the Chair of St. Peter, that the body of the Blessed Virgin was raised by God soon after her death, and taken up to glory, by a singular privilege, before the general resurrection of the dead. 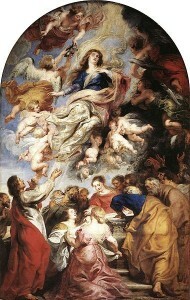 The Assumption of the Blessed Virgin Mary is the greatest of all the festivals which the Church celebrates in her honor. It is the consummation of all the other great mysteries by which her life was rendered most wonderful; it is the birthday of her true greatness and glory, and the crowning of all the virtues of her whole life. Reflection.—Whilst we contemplate, in profound sentiments of veneration, astonishment, and praise, the glory to which Mary is raised by her triumph on this day, we ought, for our own advantage, to consider by what means she arrived at this sublime degree of honor and happiness, that we may walk in her steps. No other way is open to us. The same path which conducted her to glory will also lead us thither; we shall be partners in her reward if we copy her virtues. First reading at Mass for the day of this Solemnity. “God’s temple in heaven was opened,and the ark of his covenant could be seen in the temple. “A great sign appeared in the sky, a woman clothed with the sun,with the moon under her feet,and on her head a crown of twelve stars. She was with child and wailed aloud in pain as she labored to give birth. Then another sign appeared in the sky;it was a huge red dragon, with seven heads and ten horns,and on its heads were seven diadems. Its tail swept away a third of the stars in the sky and hurled them down to the earth. “Then the dragon stood before the woman about to give birth,to devour her child when she gave birth.” She gave birth to a son, a male child,destined to rule all the nations with an iron rod. Her child was caught up to God and his throne. The woman herself fled into the desert where she had a place prepared by God.